As an ecommerce business owner, you are constantly looking for ways to improve and optimize your store. However, everything you do seems to be having very little impact. From perfecting each ad campaign to tweaking your product descriptions, only to get a 0.5% gain. Your efforts and the hours you put in seem to be in vain. But there is one thing that frustrates you more. Why are there so many people adding items to their cart but the majority of them never actually purchase anything? You wait and wait, thinking they will come back the next day to finish their order. A week later – nothing. As an ecommerce business owner, you are not alone. Shopping cart abandonment is one of the leading causes of revenue loss for ecommerce businesses. After analyzing 37 different ecommerce stores, studies showed that the average shopping cart abandonment rate was 67.23%. This means for every completed shopping cart transaction, there are two shopping carts being abandoned. If you generate a million dollars a year in revenue, you could have missed out on nearly half a million dollars in abandoned orders! So how can you recover the two-thirds of revenue that is currently being lost? Although it’s not possible to increase revenue by persuading all cart abandoners, you can at least try to recover a big chunk of that and stop leaving money on the table. MageMail has recovered over $60M in lost revenue for our customers, with the average client recovering 15%. We looked at the top performing Magento ecommerce stores using MageMail as their abandoned cart software and picked out the best performing emails that are getting them great results. In our study, we define “top performing” to be stores that have at least 10% of their total revenue coming from abandoned cart emails. Our most successful customer had 35% of their total revenue coming from abandoned cart emails! In our analysis of Magento ecommerce stores, ranging from as small as 468 customers to stores up to 65,000 customers, from clothing retailers to robotic toys, we sought the key components to what makes a great abandoned cart email. Abandoned cart emails are reminders to customers who have added items to their shopping cart but did not finish the transaction. 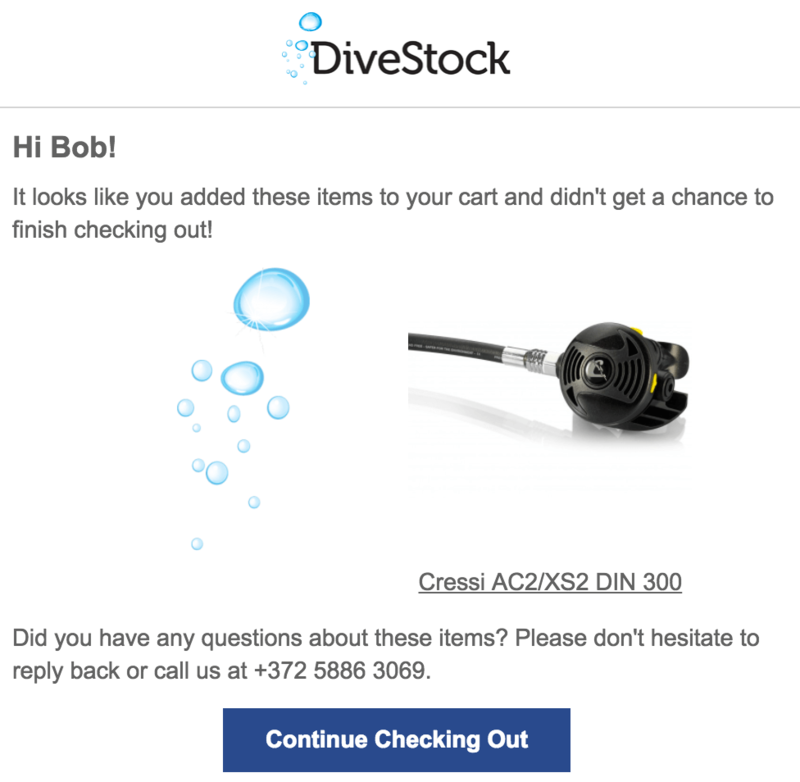 This email by DiveStock is simple and gets the message across. With a few lines of text and an image of the abandoned item, this one email contributed to 35% of their total revenue in the past 90 days. According to a 2016 Q4 Salecycle study, 28.3% of ecommerce revenue came from abandoned cart emails. The stats don’t lie. 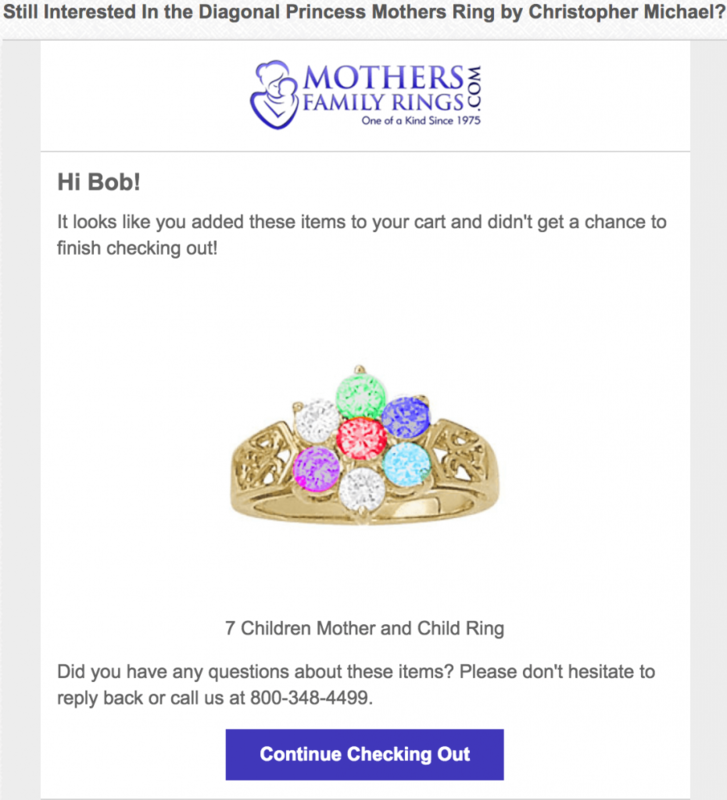 Abandoned cart emails are a must if you want to increase existing revenues. 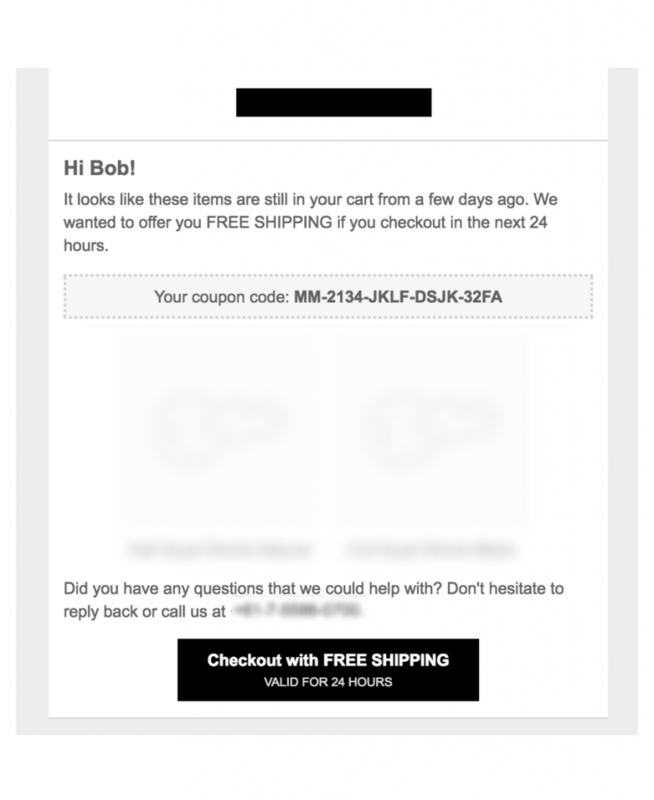 What’s In An Abandoned Cart Email? 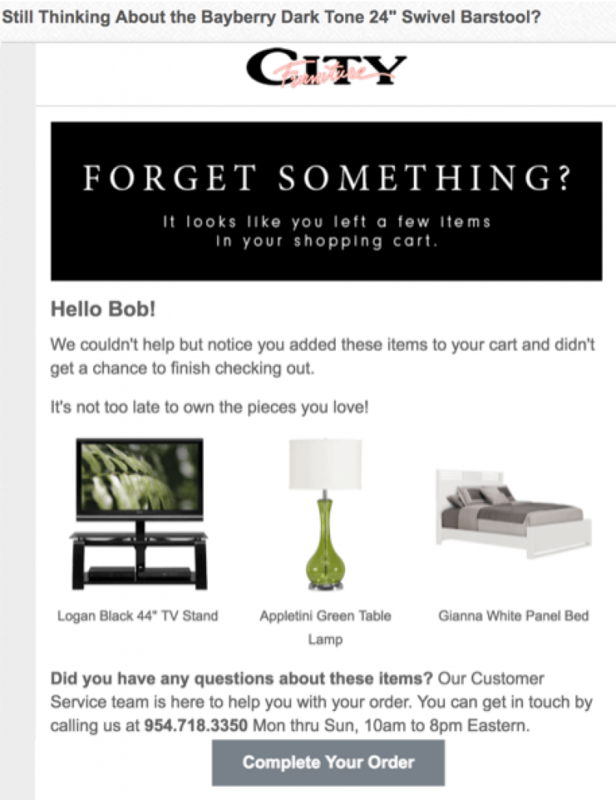 Every abandoned cart email must provide a way for the customer to get back to their shopping cart and continue where they left off, or at the very least remind them of what they were purchasing. Your customers may need some time to think about a purchase and after a few hours, they might decide that they do want to buy it. An email sent a few hours, or a day after abandonment is a great way to remind them of products and why they wanted it in the first place. However, sometimes they never truly abandoned their cart in the first place. 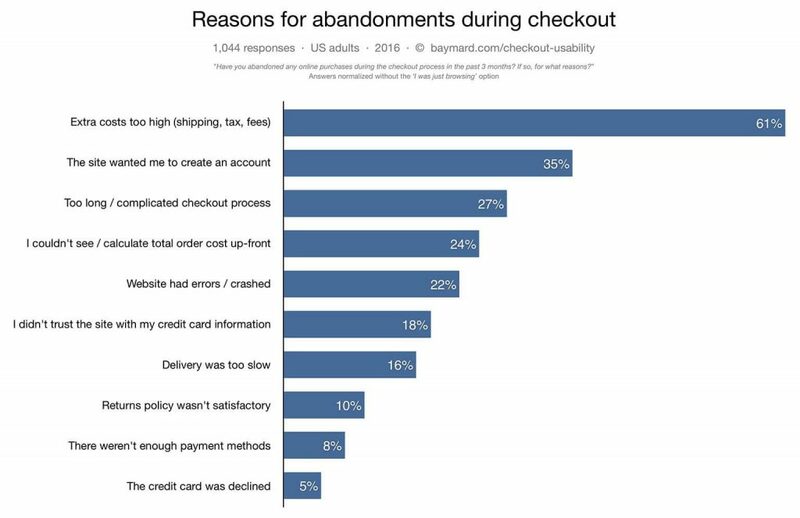 As seen before in Baymard Institute’s study, 22% of abandoned carts were due to website errors – for instance, customers were trying to proceed to checkout, but the website had problems with their payment system. With full buyer’s intent, it would be crazy not to do anything about it. The easiest way to get those customers back is by preserving their shopping cart and sending them a link that lets them continue where they left off before. This link lets them skip the entire registration page so they don’t have to provide that information all over again. Here’s a quick example by City Furniture. The message is very clean and simple. It uses only two short sentences along with enlarged images of their abandoned products. This abandoned cart email generated 15% of their entire revenue from the past 90 days and is only one of three abandoned cart emails in their funnel. This is the first of two emails in their funnel, which has also generated 15% of their total sales. 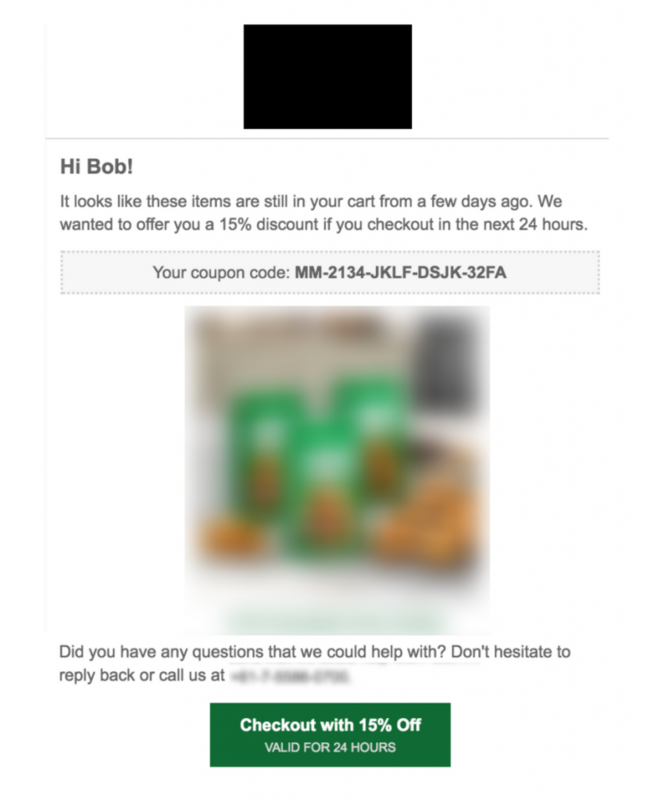 Abandoned cart emails don’t have to be complicated. So far we have seen very simple email copy, which has been giving the stores massive results. Download our FREE PDF with our best practices in crafting your abandoned cart email! Next, we can look at some more complex ways to dramatically improve our abandoned cart emails. These aren’t essential, but they sure make a big difference. The majority of customers don’t follow through because of the final price being higher than they expected. Remember how 61% of abandoned carts were due to the extra costs from shipping, taxes and additional fees? A simple way to get around this is by offering them free shipping. Their email subject: “Free Shipping. No Minimum. Use code … at checkout. Offer Ends…” The free shipping offer is made clear right away in the subject to increase the likelihood of the customer opening the email. People have short attention spans and don’t have time to read a story, so we have to make sure we catch their attention within the first few seconds. The free shipping offer does just that (written in capital letters), followed by the code and large call to action button at the bottom. Notice how they didn’t give away free shipping freely. To be eligible, you have to spend over $100 to claim the free shipping. This encourages customers to spend more, a great strategy for small businesses that are starting off, but can’t afford to give away free shipping all the time. Another way we can get around the problem of visitors abandoning their cart due to the final price being higher than expected is by offering a discount. 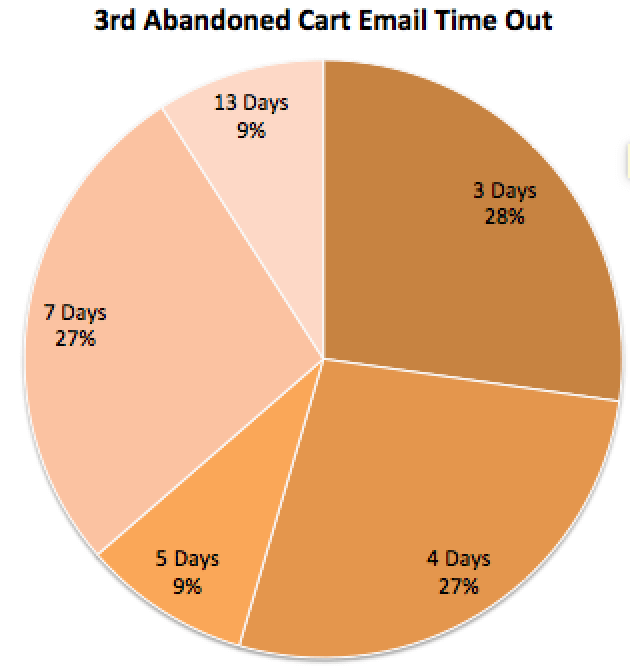 From our analysis of the top performing abandoned cart emails, the majority of them offered a discount – predominantly in their second abandoned cart email. Another simple, but a highly effective example of email copy. Two lines of text, product images, a clear outline of the 5% discount coupon code and the call to action button leading them back to their shopping cart. This is their last email in their three-email abandoned cart funnel. 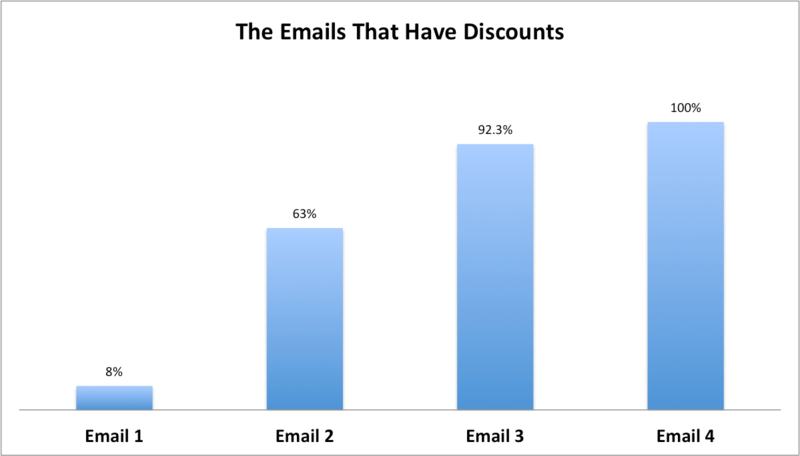 The added discount made sales revenue from email 3 greater than email 2. The added discount code gave an extra boost in buyer’s intent, maximizing their revenue potential. Let’s look at another discount offer but with an added twist. 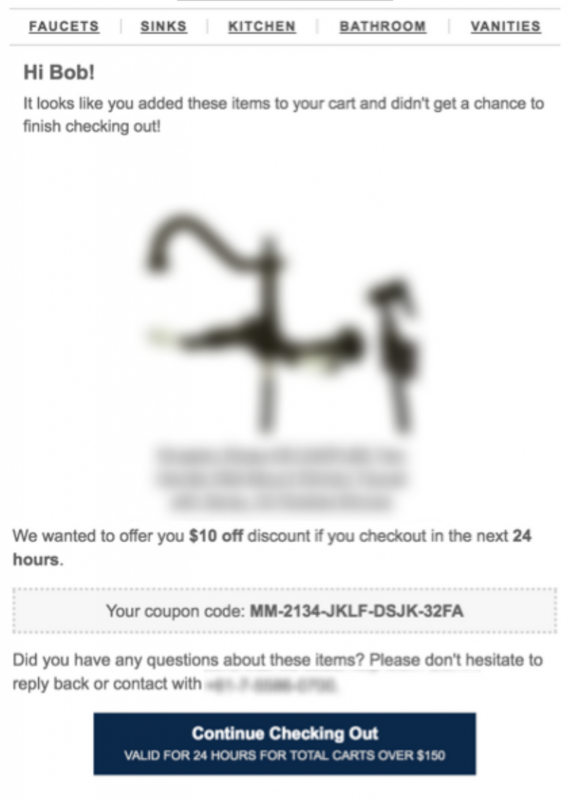 Here’s a MageMail customer’s first abandoned cart email with a $10 discount. Notice how the code only applies if your cart is over $150. This encourages the customer to spend more if they want the $10 discount reward. 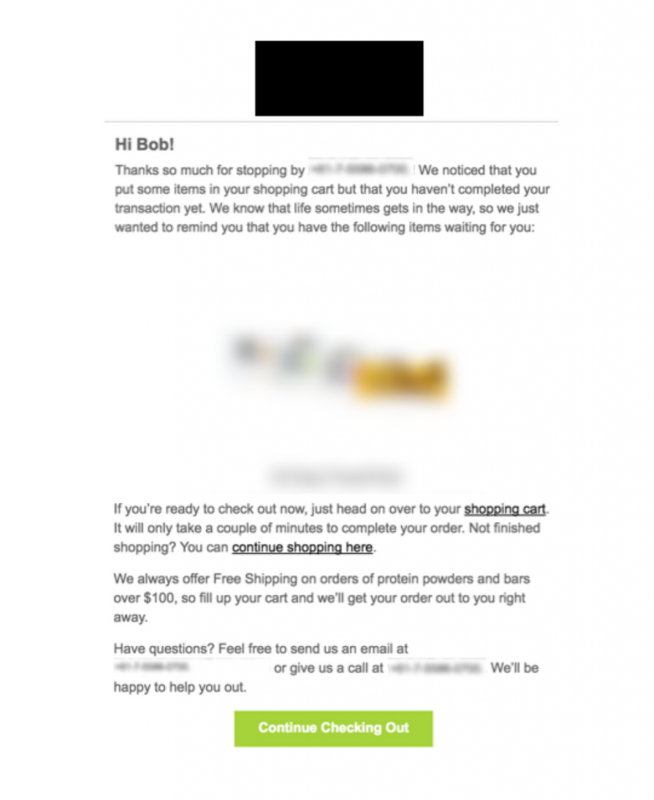 This one email generated 15% of the ecommerce store’s entire revenue (in the past 90 days). You may be wondering is there a definitive discount price or percentage to hit the “sweet spot”? From analyzing the top performers, all customers except one used a percentage discount code. The majority of them were either 5% or 10% discount, with only two companies being anything more than that. One of these companies offers a 15% discount code, which is introduced in the second email within their funnel. Their entire sales funnel (2 emails with the first email having no discount) is contributing 10% of their total revenue. Creating discounts can be tricky, because you’re essentially sacrificing your margins. What’s the right percentage off to offer to your audience? It all depends on what’s the right fit for your business and customers – you’ve got to test, test and test some more. You may also get some sneaky customers taking advantage of your discounts by purposely abandoning their shopping cart, especially with a discount of 20%. The 20% discount is for visitors who have never ordered before while the 5% discount is for returning customers. This strategy is great as it entices first time buyers. It also encourages them to be returning customers as they will see the store as being trustworthy and happy to repurchase in the future. You may have noticed that every offer we’ve seen so far is only valid for some certain time – typically anywhere from 24 hours up to 48 hours. This is the power of scarcity. It’s a powerful psychological sales trigger, which makes customers afraid they will miss out on the discount or that the item might sell out. 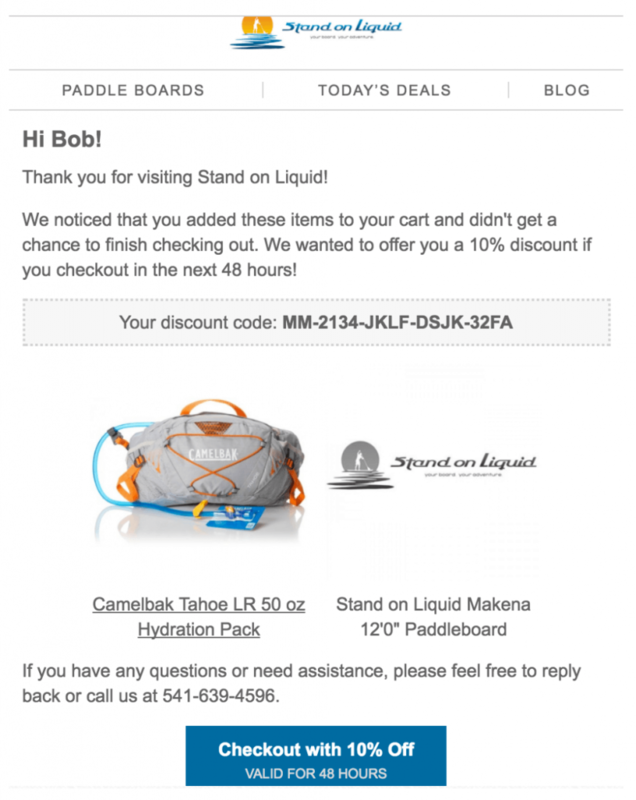 Here is Stand On Liquid’s 10% discount code that is only valid for 48 hours. They only use one abandoned cart email, but as you can see, one is all they need. 15% of their total revenue is coming from this one abandoned cart email. From analyzing the top ecommerce stores (at least 10% of their sales revenue is coming from their abandoned cart emails), we get a wide range of variability within the abandoned cart email funnel. 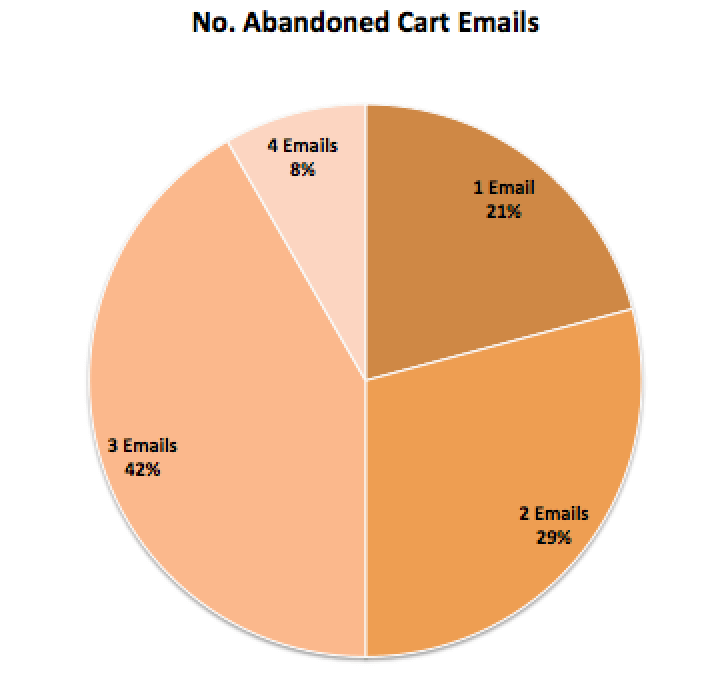 The number of abandoned cart emails within the funnel ranged from one to four emails. Even though some stores are having great results with one email, two to three emails work best according to our data. The first email is typically used to capture customers that have full buyer’s intent but did not complete their transaction – website errors or needed time to think about the purchase. The second and third emails are to give customers that extra “nudge” and remind them about their products. 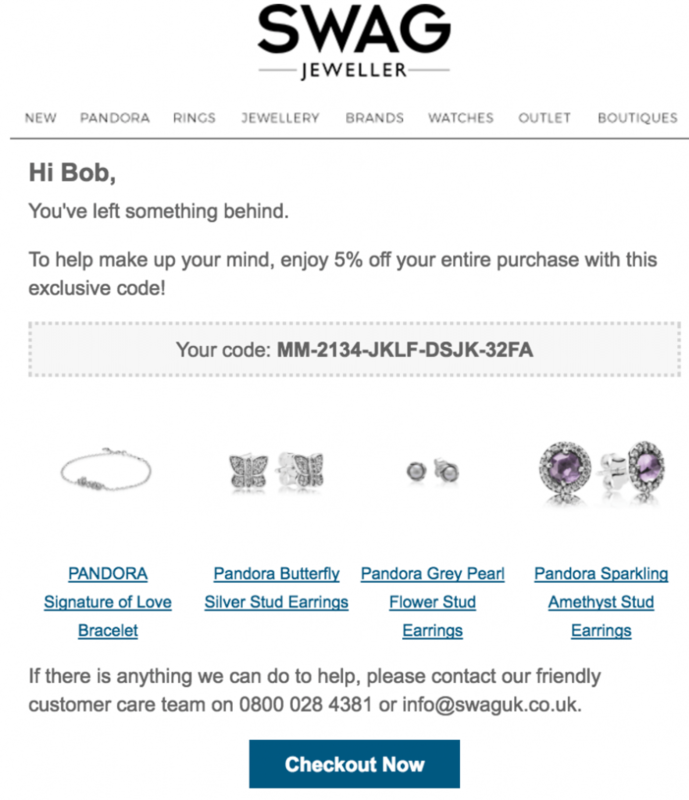 Discounts should be introduced in these emails to give prospects more of an incentive to purchase. Four emails were rarely used in the funnel. The revenue generated on the fourth email was either zero or close to it, and not to risk looking spammy and lose subscribers, we recommend sticking with a maximum of three emails. Any more than four email seems overkill and overly spammy, with a risk of leading to unsubscribers. It also makes sense that if they haven’t purchased by the fourth email, they’re not going to purchase at all. Only two stores analyzed offered no discounts in their first email. This is to minimize the loss on your margins by taking into account customers who have full buyer’s intent but may have had website errors or needed some time to decide on the purchase. 96% of stores used some form of discount in their abandoned cart emails, with two-thirds of the stores introducing the discounts on the second email. The latest (and most popular) time at which the first abandoned cart email sent out was 24 hours after abandonment, and the most immediate ones were 1 hour later. For the first email sent, we analysed the percentage of revenue recovered (in terms of their total revenue) for each of the different timings. 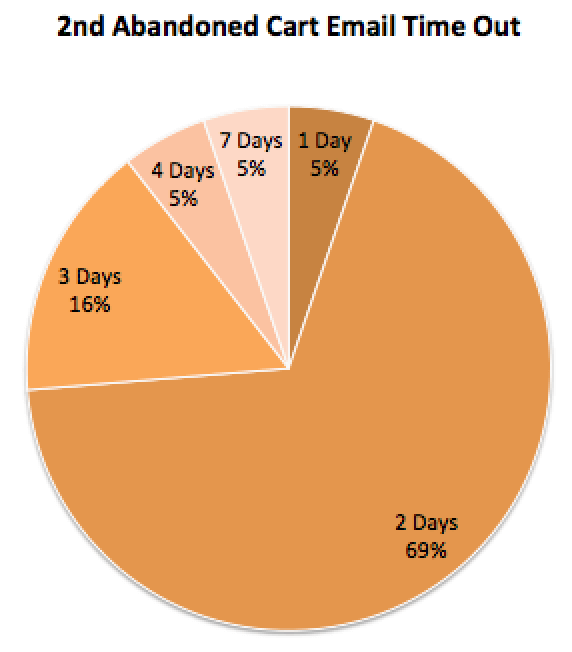 Although 24 hours after abandonment was the most popular, emails that were sent out 1 hour after abandonment recovered a greater percentage revenue. With this in mind, we recommend sending out your first email 1 hour after cart abandonment. However, if you choose to do something different, the first email should be within the first 24 hours so customers don’t forget about the products – anything greater than 24 hours has proven ineffective. The time at which the second email was sent was predominantly 2 days after abandonment. There was no distinct timing for the third email – it ranged anywhere from 3 days all the way up to 7 days, with an outlier of 13 days. We recommend starting with 3 or 4 days after abandonment and split testing from there. Some interesting stats you have there Erik. I have my first abandoned cart email set up for 24 hours out from abandonment. If 1 hour generates more percentage in revenue, I’ll definitely have to try that out! Give it a try, Fraser. Would love to hear how the change in timing works for you!